NOTICE: This content discusses features in beta software that may change in the final release version. 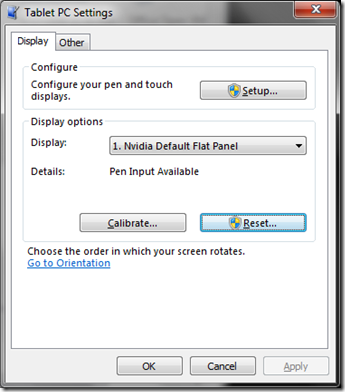 This is an extension of my other touchscreen calibration post for Vista. I tested it on my HP Pavilion tx1220us tablet PC with Windows 7 Beta installed, and I made the trick work by following these steps. As instructed, open up the Tablet PC Settings in the Control Panel and reset the calibration and the tabcal utility will be allowed to run a calibration. There’s one gotcha to using the added calibration points in the Windows 7 utility however. 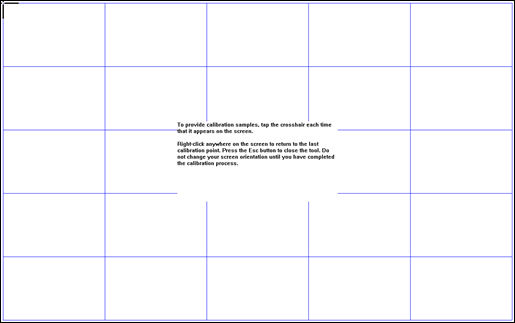 If the same XGridPts and YGridPts values are used (as discussed in the instructions for Vista), the grid points will be covered by the instruction text block. The taps will not register for areas that are covered. Just specify different XGridPts and YGridPts that will be outside the covered area.